For today’s deals roundup, we’ve found out some deals on Paytm Mall under Rs 500. The list includes products like wireless mouse, Portable speaker, earphones and more. If you’re looking to find a good deal on a mouse or an earphone on a limited budget, then you're at the right place. We’ve put together a group of gadgets in the list that are available on Paytm Mall for less than Rs 500. The list consists of audio devices and a mouse from brands like Philips, Logitech, and more. The Philips SHE 1455 comes equipped with an in-line microphone and remote that let users take calls and manage audio tracks. As per the company, the earphones can block external noise for a better listening experience. You can purchase this device here. The Zebronics Saga Portable BT Speaker enables users to stream music via Bluetooth, AUX and USB cable. The device is also equipped with a built-in FM receiver as well. You can purchase this device here. The SanDisk Ultra 16GB Pen drive features USB 3.0 connectivity and is also compatible with USB 2.0 interface. As per the company, it can transfer data at rates of 100Mbps. You can purchase this device here. The Skullcandy S2DUDZ-003 In-Ear headphone is said to offer complete in-ear seal that restricts outside noise. The earphone is equipped with a 10mm driver and weighs around 100gms. You can purchase this device here. 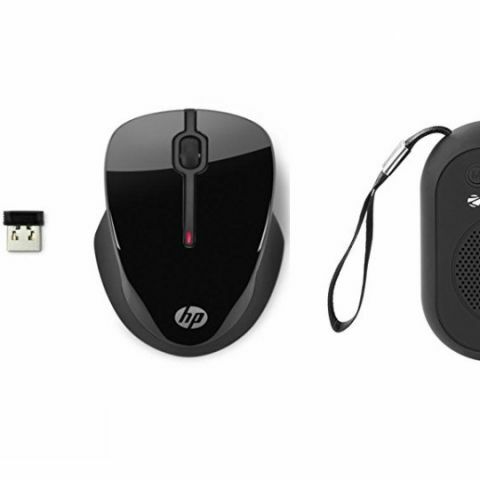 The HP 200 is a wireless mouse that is operable from distances of up to 10 meters. The mouse connects to a pc via a receiver that requires no additional software. Users can simply plug in the receiver into a USB port and they are good to go. You can purchase this device here.